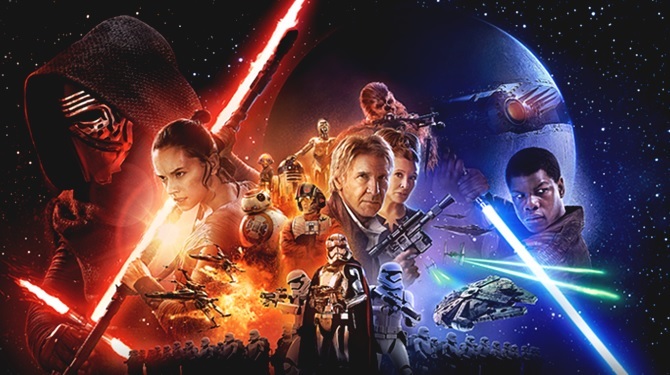 Life & Beyond : STAR WARS: THE FORCE IS STILL IS THERE.. I haven't seen the movie. It is releasing in India tomorrow but I can't say when I will go to watch it. But that doesn't mean I am going to keep myself aloof from one of the most important marketing events of the year that comes garnished with what has unarguably become an important cultural phenomenon - recreating and re-living the 'Star Wars' experience. And a journey through the reports after the movie was released, and a journey through the events and reports that preceded the release, tell us how a brilliant marketing campaign was weaved around a movie franchisee that has made words like Luke Skywalker, Han Solo, Yoda, Darth Vader, Jedi, Sith, Princess Leia, Chewbacca, Count Dooku, Obi-Wan, Death Star, R2-D2, Galactic Empire, Lightsaber, Stormtroopers and many others part of contemporary lingua franca - inspiring loads of spin-offs - in every age right from its first release in 1977. Going by the majority of reports and assessments, it can be said the film has successfully 're-launched' the franchisee with the same essence that made the first two trilogies of the 'Star Wars' series cult classics - narratives that make you feel positive about plausibility of their fantasy - here an alternative universe the 'Star Wars' way. 'Star Wars: The Force Awakens' tells 'the Force' is still there - with grand success of marketing events before the release of the film and the iconic triumph that it achieved after its release. Fantasy, any sort of, is inseparable part of our existence but erecting them on celluloid requires a master's craft. Very few narratives have excelled in that and we can say the 'Star Wars' series is one in the league (another valid example here is the two 'Ring' trilogies - 'The Lord of the Rings' and the 'The Hobbit') and it is good to read that this 7th movie in the series, with a new production house and a new director, has extended the space opera logically from its 2005 release, 'Star Wars Episode III: Revenge of the Sith'. Disney, which acquired Lucasfilm for US$ 4 Billion in 2012 has played well in taking the 'Star Wars Universe' ahead. The company mounted a massive pre-release marketing campaign, and as per reports, 'The Force Awakens' had already grossed around US$ 250 Million before it hit theatres. No other marketing campaign has generated this sort of intense buzz except Apple's iPhone launch in the recent history. Similar reports of fans waiting in long queues outside theatres (in case of the film) or shops (for iPhones) make for cultural extensions to these two brands. While Disney put in intense efforts starting with release of 'Star Wars comic book' in January, the buzz around the next iPhone starts building up by March-April and peaks in August-September before the September launch event of iPhone. Critics and people, at large, have appreciated the film and have gone on to say that 'The Force Awakens' successfully talks to the nostalgia in them for 'Star Wars' films. And the film's record-breaking financial success so far and its projections for the days to come reaffirm it.